Chi Alpha is committed to missions. We support that every student should go on at least one short-term missions trip during their studies. We challenge students to serve in missions for one year after they graduate. Give a year and pray about a lifetime. The Chi Alpha team that I am involved with goes on regular short-term missions trips to 'Theo's place' in Fond Doux near Vialet near Petit Goave, Haiti. 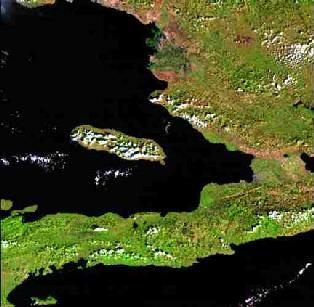 This place is located just northeast of a huge lake - before the hurricane Gustave in Sept. 2008, it was two lakes, which can be seen on the satellite picture on the left above: They are in the upper middle of the southern part of Haiti, below the island. You also can find 'Theo's place' on Google Earth, the coordinates are 18o, 25', 30'' North, 72o, 58', 38'' West. Fond Doux is located in between Miragoane and Petit Goave at 'Route Nationale #2', one of 4 highways in Haiti (the red lines in the map above). They got repaired and re-paved in fall 2007, which basically means, they are like paved country roads now. 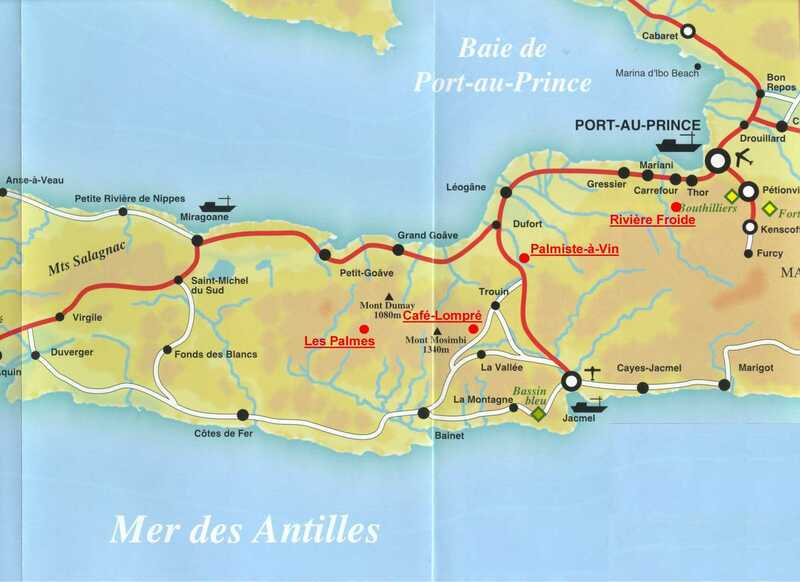 It now takes us approximately 3 hours to cover the 70 miles to go west to our place from Port au Prince. (*): Elisha Chan is starting a business in Haiti. I count her business trips here, too. Not mentioned below: Trips in August 2013, December 2013, March 2014. Please visit Elisha C.'s background website and her online webstore. She is bringing economic stability to Haiti by using international business to create jobs for the Haitian people. Haiti in the hands of Haitians. 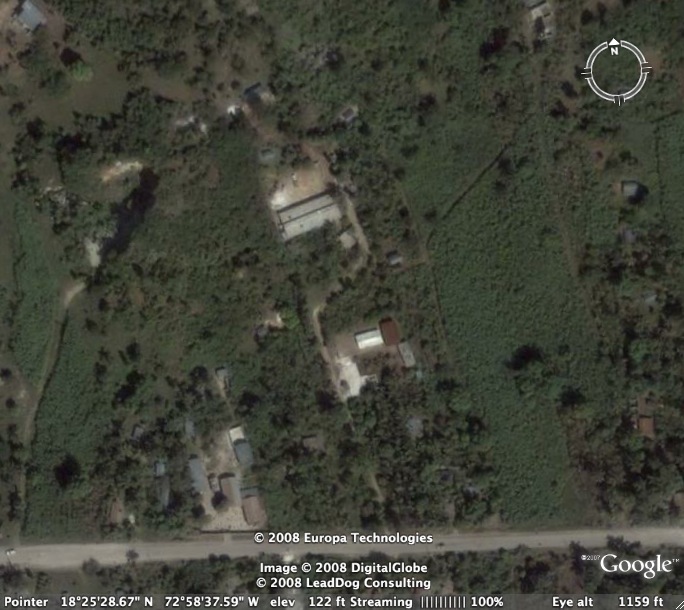 This is a picture of our place in Fond Doux, Haiti, from Google Earth in 2008. In the bottom of the picture is the highway Rue Nationale #2. You can see the little way up to our place and the buildings on our property. West to our place, closer to the highway, you can see the smaller buildings from a Wesleyan church and school. You also can find good short write-ups and testimonies about some of our trips, including some good pictures, on Brian Kloefkorn's Haiti reports page. Kimberly Bui traveled to our place in Haiti by herself. This was in Summer 1998. May 22 - June 2, 2002: My first Haiti missions trip. 14 people: Uwe Muench, Winston Bui, Kimberly Bui, Brian Kloefkorn, Sara Benton, Jeff Grogan, Matt Lunders, Jerrod Adair, Jake Spain, Rob Satterfield, Eric Thomure, Tim Faas, Amy Morgan (Pounds), Karen Greening (Wasch). My pictures from this trip (try here w/o facebook account). January 3 - January 12, 2003: My second Haiti missions trip. 14 people: Uwe Muench, Winston Bui, Kimberly Bui, Brian Kloefkorn, Sara Benton, Jeff Grogan, Matt Lunders, Tim Faas, Rebekah Thomure, Jessica Yoder (Goldenberg), Royce Moore, Melanie Farley (Moore), Phil Howard, Clint Arasmith. Please see Brian's report for more details. A video from this trip. May 19 - June 1, 2003: My third Haiti missions trip. 12 people: Uwe Muench, Winston Bui, Kimberly Bui, Brian Kloefkorn, Sara Benton, Jessica Yoder (Goldenberg), Jeff Grogan, Matt Lunders, Andy Hayes, Amy Morgan (Pounds), Jake Spain, Brian Pounds. Sara Benton stayed another 2 weeks. For three weeks in July and August 2003, 2 people stayed in Haiti: Kimberly Bui and Amy Morgan (Pounds). January 4 - January 15, 2004: My fourth Haiti missions trip. 15 people: Uwe Muench, Winston Bui, Kimberly Bui, Brian Kloefkorn, Sara Benton, Jessica Yoder (Goldenberg), Jeffrey Grogan, Matt Lunders, Andy Hayes, Tim Faas, Lynnell Lawson (Hayes), Carrie Raymond (Dahmer), Amy Anderson, Josh Neustrom, Kellie Hoelting. June 3 - June 15, 2004: My fifth Haiti missions trip. 13 people: Uwe Muench, Winston Bui, Kimberly Bui, Brian Kloefkorn, Sara Benton, Jessica Yoder (Goldenberg), Andy Hayes, Royce Moore, Lynnell Lawson (Hayes), Rebekah Thomure, Regina Waage (Peters), Chris Peters, Charles Ranta. May 18 - June 1, 2005: My sixth Haiti missions trip. 16 people: Uwe Muench, Winston Bui, Kimberly Bui, Brian Kloefkorn, Sara Benton, Jessica Yoder (Goldenberg), Matt Lunders, Carrie Raymond (Dahmer), Angela Lewis, Britani Siebeneck, Anne Walters, Joseph Lanham, Heath Harris, Jordan Yoder, Mark McLellan, Ryan Stroder. July 3 - July 13, 2007: My seventh Haiti missions trip. Winston Bui stayed a few days longer, until July 19, 2007, Uwe Muench and Sara Benton stayed until July 23, 2007. Charles stayed a few days less, he had to leave on Dec 18, 2007. Mitch's pictures from this trip on facebook. June 25 - July 10, 2008: Trip 9 -- My eighth Haiti missions trip. 13 people: Uwe Muench, Winston Bui, Brian Kloefkorn, Sara Benton, Jessica Yoder (Goldenberg), Clint Arasmith, Angela Lewis, Mitch Goldenberg, Adam Fitzpatrick, Florence Akinyemi, Farika Rusli (Reyes), Matt Silverman, Desiree Cabot. For Uwe Muench, the trip began on June 24 and ended on July 11, 2008. June 17 - July 2, 2009: Trip 10 -- My ninth Haiti missions trip. 16 people: Uwe Muench, Winston Bui, Brian Kloefkorn, Sara Benton, Jessica Yoder (Goldenberg), Clint Arasmith, Angela Lewis, Mitch Goldenberg, Adam Fitzpatrick, Florence Akinyemi, Vanesa Chua, Rusty Lmuth, Joy Ellis, Elisha Chan, Rachelle Hamilton, Alicia Slater. For Uwe Muench, the trip began on June 14 and ended on July 3, 2009. 3 people stayed a couple of weeks: Winston Bui, Sara Benton, Mitch Goldenberg. Dec 9 - Dec 22, 2009: Trip 11 -- My tenth Haiti missions trip. 13 people: Uwe Muench, Winston Bui, Brian Kloefkorn, Sara Benton, Jessica Yoder (Goldenberg), Mitch Goldenberg, Clint Arasmith, Angela Lewis, Tim Faas, Dave Citrin, Elisha Chan, Rachelle Hamilton, Jennifer Hernandez. Mar 16 - Mar 27, 2010: Trip 12 -- My eleventh Haiti missions trip. 8 people: Uwe Muench, Winston Bui, Sara Benton, Jessica Yoder (Goldenberg), Mitch Goldenberg, Clint Arasmith, Elisha Chan, Guy Ashley. June 15 - July 1, 2010: Trip 13 -- My twelfth Haiti missions trip. 21 people: Uwe Muench, Winston Bui, Kimberly Bui, Kaiya Bui, Brian Kloefkorn, Sara Benton, Jessica Yoder (Goldenberg), Mitch Goldenberg, Clint Arasmith, Angela Lewis, Tim Faas, Elisha Chan, Rachelle Hamilton, Jennifer Hernandez, Joy Ellis, Matthew Silverman, Alicia Slater, Curtis Montgomery, Raul Alvarado III, Stephanie Medina, Aaron Jordan. Kimberly Bui, Kaiya Bui, and Curtis Montgomery stayed a few days less, they had to leave on June 25, 2010. August 19 - September 3, 2010: Trip 14 - My thirteenth Haiti missions trip. 9 people: Uwe Muench, Winston Bui, Kimberly Bui, Sara Benton, Jessica Yoder (Goldenberg), Mitch Goldenberg, Angela Lewis, Elisha Chan, Tom Vasvary. Kimberly Bui, Angela Lewis, and Tom Vasvary stayed a few days less, they had to leave on August 27, 2010. Trip 15 was planned for December 2010. We had to postpone it, because of political unrest that cancelled all Haiti flights at least between Dec 8 --Dec 12. June 13 - June 29, 2011: Trip 15 - My fourteenth Haiti missions trip. 22 people: Uwe Muench, Winston Bui, Kimberly Bui, Kaiya Bui, Sara Benton, Jessica Yoder (Goldenberg), Brian Kloefkorn, Mitch Goldenberg, Angela Lewis, Clint Arasmith, Elisha Chan, Florence Akinyemi, Rachelle Hamilton, Adam Fitzpatrick, Joy Ellis, Jennifer Hernandez, Curtis Montgomery, Raul Alvarado III, Stephanie Medina, Bryan Citrin, Sandy Liautaud, Pauline Dinh. Kimberly Bui, Kaiya Bui, and Curtis Montgomery stayed a few days less, they had to leave on June 22, 2011. Pauline Dinh stayed a little longer (to meet up with her WorldVision sponsored child) and left on July 3, 2011. Dec 8 - Dec 22, 2011: Trip 16 - My fifteenth Haiti missions trip. 10 people: Uwe Muench, Winston Bui, Sara Benton, Jessica Yoder (Goldenberg), Brian Kloefkorn, Mitch Goldenberg, Angela Lewis, Elisha Chan, Bryan Citrin, Shannon Mitchell. June 19 - July 6 / July 13, 2012: Trip 17 - My sixteenth Haiti missions trip. September 6 - September 15, 2012: Kimberly Bui stayed in Fond Doux and was able to connect with Convoy of Hope in Port-au-Prince also. December 15 - December 22, 2012: My seventeenth Haiti missions trip. 2 people: Winston Bui, Uwe Muench. June 25 - July 9, 2013: Trip 18 - My eighteenth Haiti missions trip. 4 people stayed for a long week: Winston Bui, Angela Lewis, Bryan Citrin, and Dave Citrin. 7 people stayed for a long week: Winston Bui, Sara Benton, Angela Lewis, Mitch Goldenberg, Bryan Citrin, Dave Citrin, and Stephanie Medina. June 25 - July 9, 2014: Trip 19 - My nineteenth Haiti missions trip. Leaving July 17: Winston Bui, Sara Benton, Stephanie Medina, Bryan Citrin, Angela Lewis, Yancey Valdez Jr.
3 people stayed for a long week: Winston Bui, Mitch Goldenberg, and Bryan Citrin. December 12 - December 22, 2014: Trip 20 - My twentieth Haiti missions trip. 14 people: Uwe Muench, Winston Bui, Jessica Goldenberg, Mitch Goldenberg, Bryan Citrin, David Citrin, Brian Kloefkorn, Angela Lewis, Matthew Silverman, Rebecca Masamitsu, Yancey Valdez Jr, Brittnee Taylor, Heather Adamson, Elisha Chan. Traveling Dec 8 - Dec 26: Elisha Chan and her mother combined a business trip with this trip. March 18 - March 29, 2015: Trip 21 - My twenty-first Haiti missions trip. 12 people total: 7 people are there March 18 - March 27, 2015: Winston Bui, Sara Benton, Bryan Citrin, Angela Lewis, Elisha Chan, Mitch Goldenberg, Charles Ranta. 5 people are there March 23 - March 29, 2015: Uwe Muench, Philippe Videau, Eduardo Navarro, Sy Austin Clark, Tanya Alvarado. June 22 - July 10, 2015: Trip 22 - My twenty-second Haiti missions trip. 4 people stayed for 2 weeks: Winston Bui, Mitch Goldenberg, Bryan Citrin, and Angela Lewis. Elisha Chan joined the small team between August 27 and September 5, 2015. Dec 12 - Dec 22, 2015: Trip 23 - My twenty-third Haiti missions trip. Elisha Chan, her mom, and three Chinese people combined a business trip with this trip for a couple of days. 8 people: Winston Bui, Sara Benton, Mitch Goldenberg, Brian Kloefkorn, Elisha Chan, Angela Lewis, David Citrin, Yancey Valdez Jr.
June 19 - July 12, 2016: Trip 24 - My twenty-fourth Haiti missions trip. Leaving July 12: Winston Bui, Mitch Goldenberg, Bryan Citrin, Yancey Valdez Jr., Elisha Chan, Angela Lewis, Ku'uipo Cavaco. 13 people total: Traveling Dec 9 - Dec 22: Winston Bui, Bryan Citrin, Angela Lewis, Yancey Valdez Jr.
June 19 - July 2, 2017: Trip 27 - My twenty-fifth Haiti missions trip. March 24 - April 4, 2018: Trip 29 - My twenty-sixth Haiti missions trip. June 24 - July 12, 2018: Trip 30 - My twenty-seventh Haiti missions trip. 9 people: Winston Bui, Sara Benton, Mitch Goldenberg, Brian Kloefkorn, Bryan Citrin, Angela Lewis, Yancey Valdez Jr, Elisha Chan, Ku'uipo Cavaco.